This article will be looking at my experience of migrating from Windows to Linux. Mandrake Linux has developed a reputation as being a newbie-friendly Linux distribution which makes it simple for users of other operating systems to install and use. The recently-released latest version, Mandrake Linux 9.1, comes on 3 CD's which are downloadable (free of charge) or can be found at many newsagents, bundled with a magazine or booklet. I had just put a second hard drive in so installed Mandrake 9.1 on it. The installation was very easy, leaving little to be improved upon and had a very professional touch. It was no challenge at all to install, and accurately installed all of my hardware without any problems. It even detected my dual CPUs and installed the SMP kernel automatically. A boot loader called LILO is included with Mandrake 9.1, as with many other Linux distributions. This gave me the choice to boot into either Windows XP or Mandrake 9.1 at start up. I found it as simple to install as Windows XP. There is very little to say about installation, it was simple and quick. I decided upon using KDE 3.1 as my X windows environment because of its similarity to a Windows desktop. KDE 3.1 looked a lot more streamlined and aesthetically appealing than previous versions of KDE. It now comes with a brightly colored set of icons and some nice looking window decorations. I got bored of the default look of KDE 3.1 in a few weeks and started looking for ways to improve its appearance. After a while I found a nice icon pack and window decorations to match. 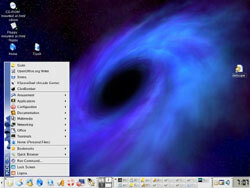 I actually enjoy the default look of KDE 3.1 compared to the default skin of Windows XP. It took a while before I was accustomed to the new graphical user interface. In particular, the layout of the menus was very different to that of the Windows start menu and it took some time until I became used to the change. However, once I got used to the different menu layout it is quite logical which makes it great for finding what you are looking for in a short space of time. I also found the fonts to be quite ugly and unreadable at higher resolutions. Most of the operating system is laid out in a completely different way to Windows, so it proved a challenge for the first little while to find the functions I was looking for. Mandrake Control Center provides a very simple way of configuring the system with minimum effort, but again the layout is different to Windows Control Panel so it takes a little getting used to. In fact, all of the new applications I started using took some time to master as the layout and functions where often very difrent to their windows equivalents. Mandrake felt noticeably faster in normal use than Windows XP on my system. The boot up times were a little bit slower than XP, but I found the interface once loaded to be quick and responsive, with a very snappy feel to it. However, when I had a lot of different applications open at once it brought the system to an absolute crawl. Perhaps a system with more memory than my 256MB would handle this situation better. Linux Mandrake uses a super mount system. This automatically mounts new file systems. It also came with a large amount of apps, from an ICQ client to a paint shop equivalent. There's all types of useful software so you do not have to immediately start finding the Linux equivalent of programs that you have become dependant on. I had no problem using all my files on my Windows XP partition (in an NFTS file system) however I was unable to write to my NFTS partition which was disappointing. I was amazed to see the amount of effort put into multimedia in Mandrake 9.1. Xine came with all of the latest Divx codecs (unlike media player) and XMMS took over the role of Winamp. A selection of painting/drawing apps were included, even a 3d modeling app! I put Netscape on the computer as Konqueror was driving me nuts, being extremely unstable. Konqueror was also slow and unstable for browsing files on my hard drive. I am still in the process of looking for a fast stable file browser - for the moment I am using the Gentoo file browser. I also found NVIDIA’s Linux drivers far from satisfactory. Instead of being able to install the rpm as I was expecting, I was instead presented with a .run file. I had to leave the X window environment and install it from there. I also had to modify a line of text in a configuration file. All of this would prove very confusing to someone new to Linux so I have to say I was extremely disappointed with NVIDIA. I also found that I must have not selected the correct packages or something while I was installing because Mandrake 9.1 did not have kppp (a dial up utility) so instead I had to get it off one of the Mandrake CD's.